PLEASE HELP PRESERVE THE GROUND ZERO MEMORIAL NOW! 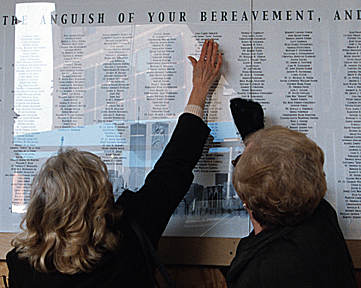 Like the Vietnam Veteran's Memorial in Washington D.C., the Ground Zero Memorial gives visitors a chance to reach out and touch the names of loved ones. Installed at the Family Viewing Platform at Ground Zero, this installation memorialized all the victims of the attacks on the World Trade Center, including those on American Airline flight 11 and United Airline flight 175. Donate Any Amount. 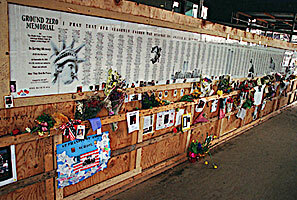 A living expression of love and loss, many visitors have adorned the Ground Zero Memorial with offerings of flowers, cards and notes to their loved ones.